BASF is a chemical company headquartered in Germany with a global presence. They have a saying: “We create chemistry”. 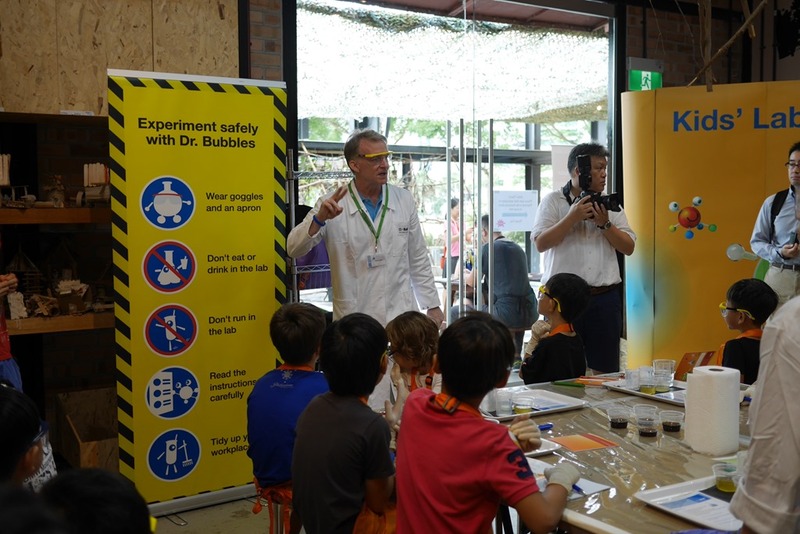 And one of their social responsibility is to make science/chemistry fun and enjoyable to kids at a young age. I wished we had all these when we were young! My recollection of chemistry in school was the memorisation of the periodic table! 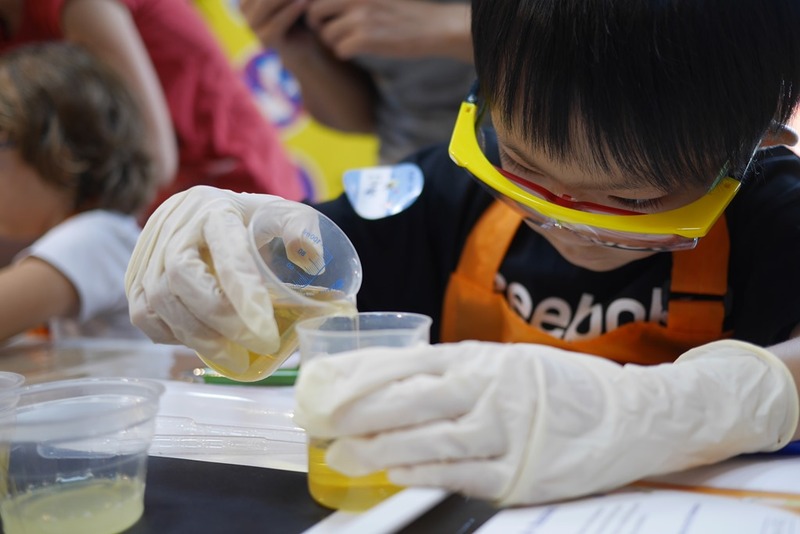 With presence in more than 30 countries, BASF Kids’ Lab was set up to allow kids to have fun in experiment and marvel at how chemistry works in today’s world. 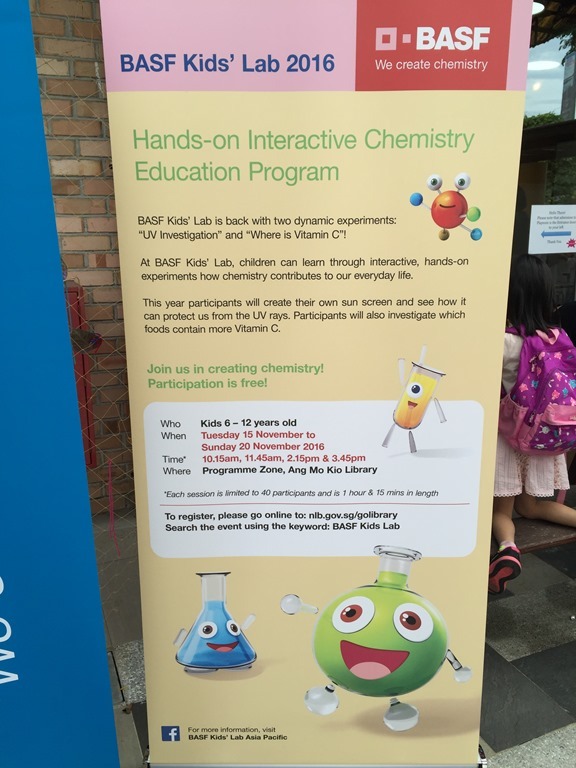 BASF is back in Singapore again this Nov/Dec school holidays to wow and interest kids in science! Most importantly – FOR FREE! Yes! 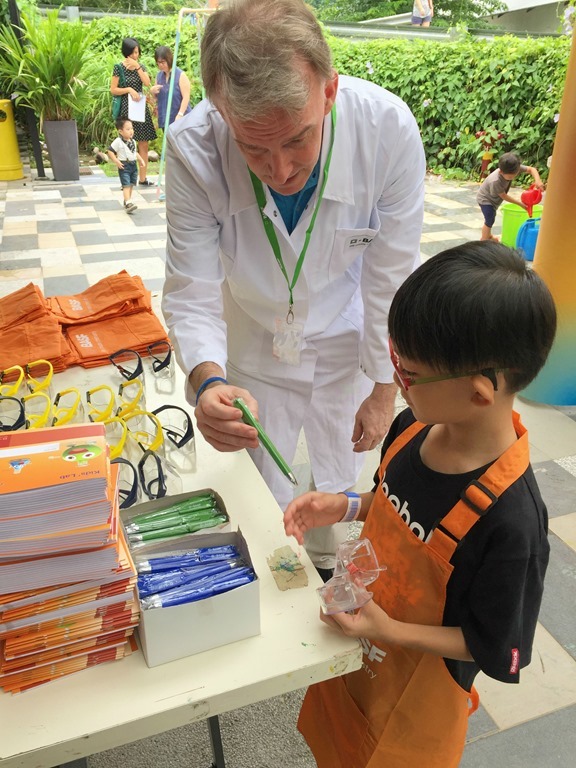 Don’t miss out this immensely popular experiment workshop which will be held for FREE at Ang Mo Kio Library. 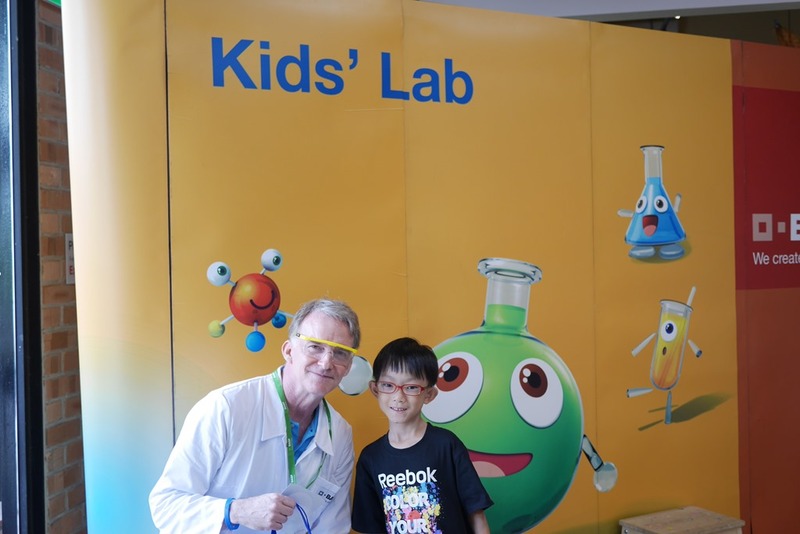 To register, please go online to www.nlb.gov.sg/golibrary and search for BASF Kids Lab using as the keyword. ** The registration starts on 17th Oct 2016 (TODAY!) and slots are running out fast! 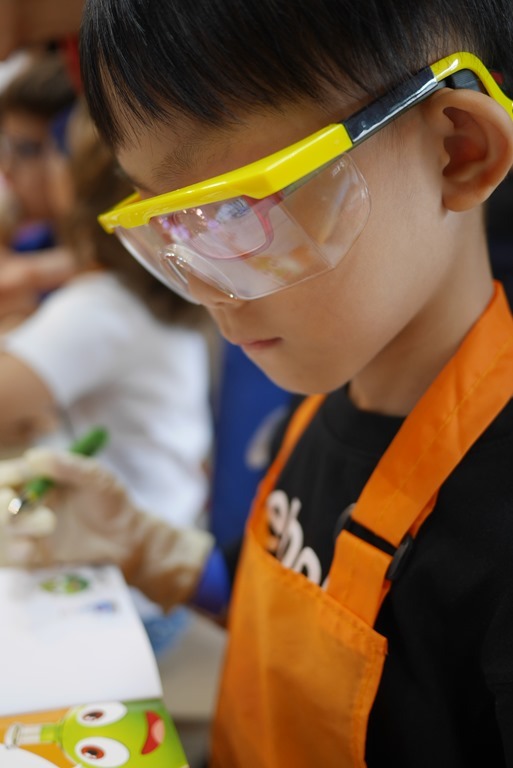 Safety goggles, protective apro, a notebook, pen and gloves (no less) are given to the kids after registration. 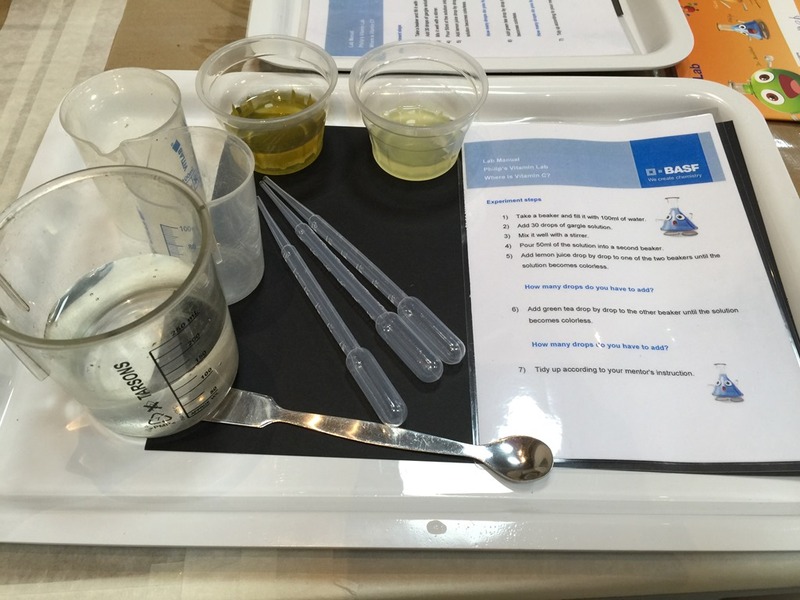 Safety first is BASF’s priority as the kids will be handling real chemical! Nothing to worry about as long as they don’t decide to put stuff in their mouth. 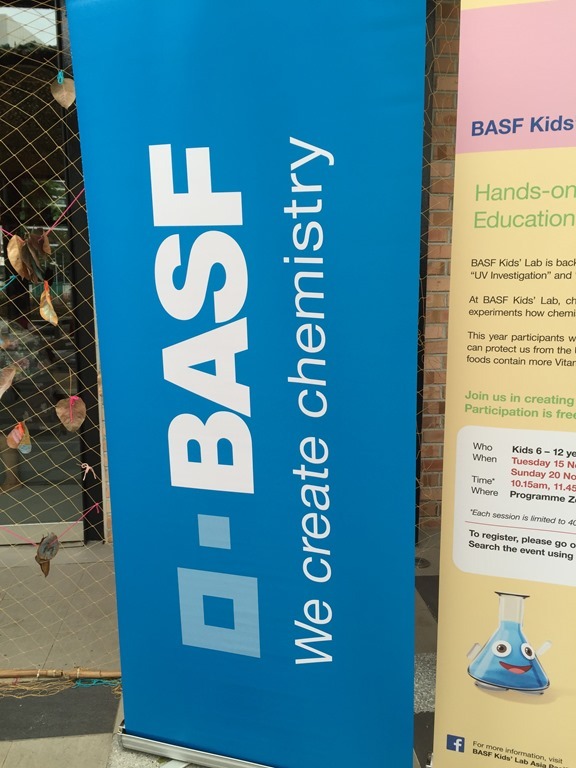 We were introduced to the what BASF is about and why they are engaging kids to learn about chemistry at a young age. BASF doesn’t actually manufacture things but it make things better/easier. E.g. They make the rubber in the rubber soles of a track shoes and etc. 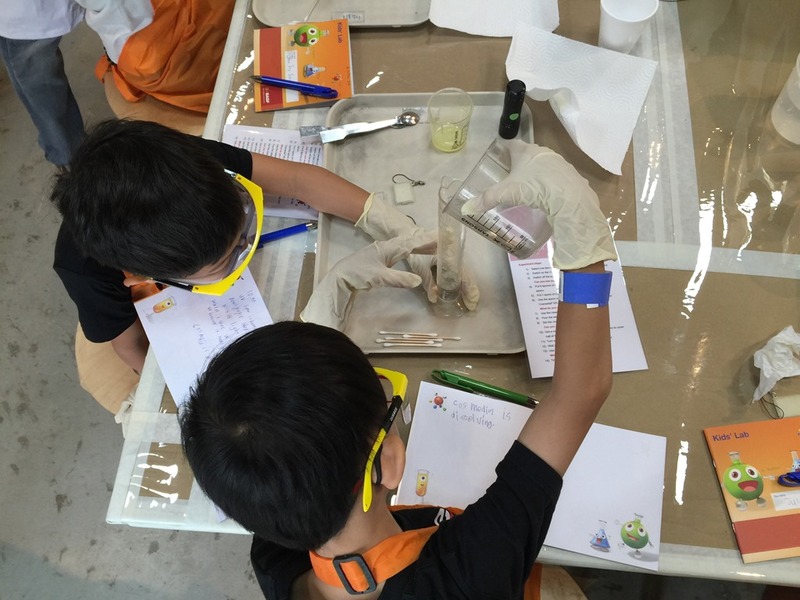 The kids were reminded of the safety rules as they are dealing with the real chemical stuff. There were 2 different experiments that the kids worked on. It is real iodine, real beaker, UV torch and even real chemical. Keeping it real make the fun even more fun (and exciting!). 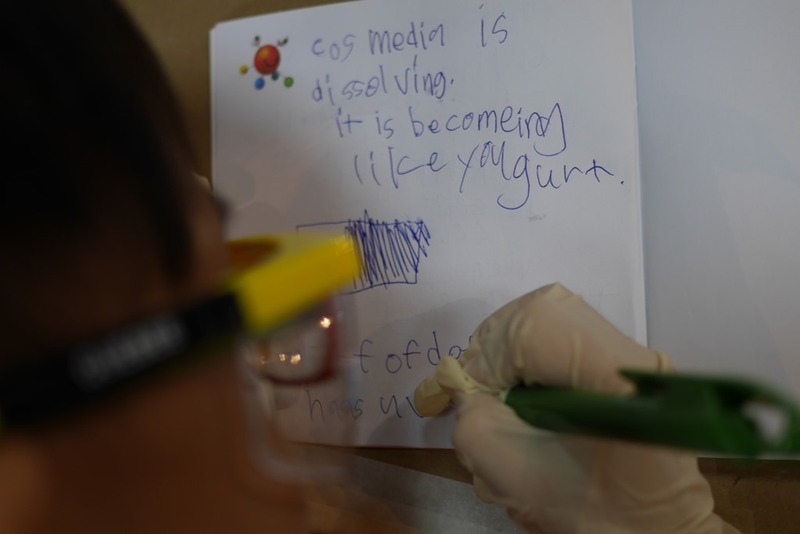 I thought it is great to let primary school kids dabble with the real stuff before they even reach secondary school age. There was an instructor and an assistant at each table of 8 kids (who were paired up). 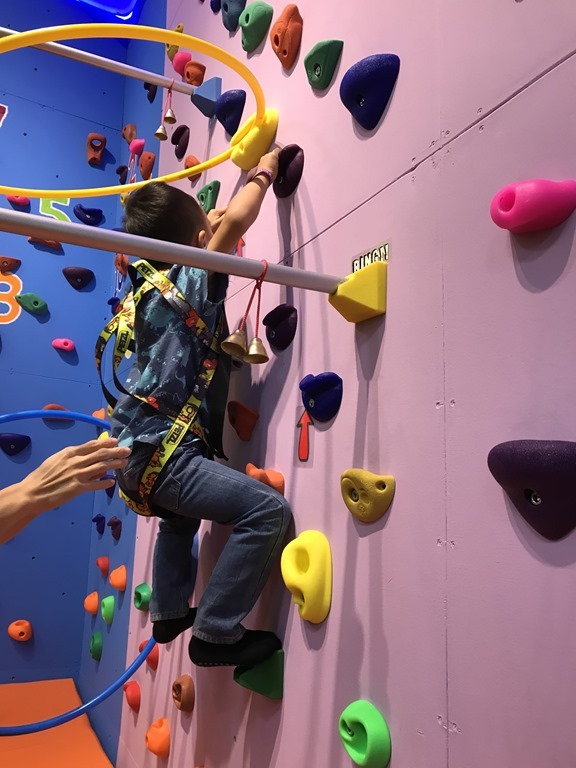 There were more than sufficient staff around to help out and guide the kids. 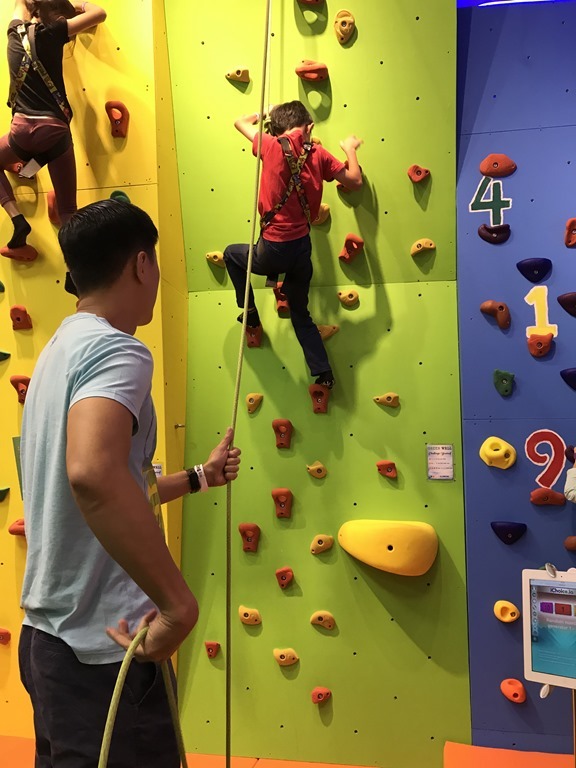 The instructor gave good instructions to start the kids off and stop them if they are doing something dangerous. 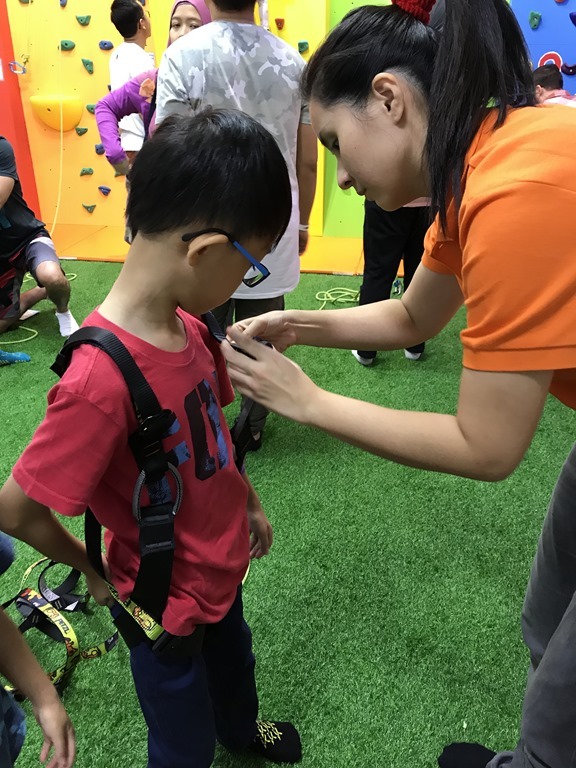 Otherwise, the kids were encouraged to observe, draw their own conclusion and write their observations down in the note book. I liked it that the instructor didn’t just gave the answers too quickly. Rather they paused and allowed the kids to consider the results of the experiments and draw their own conclusion. And conclusions do not need to be the same. E.g. There is vitamin C in lemon juice OR There is less Vitamin in green tea. Both observations are correct. 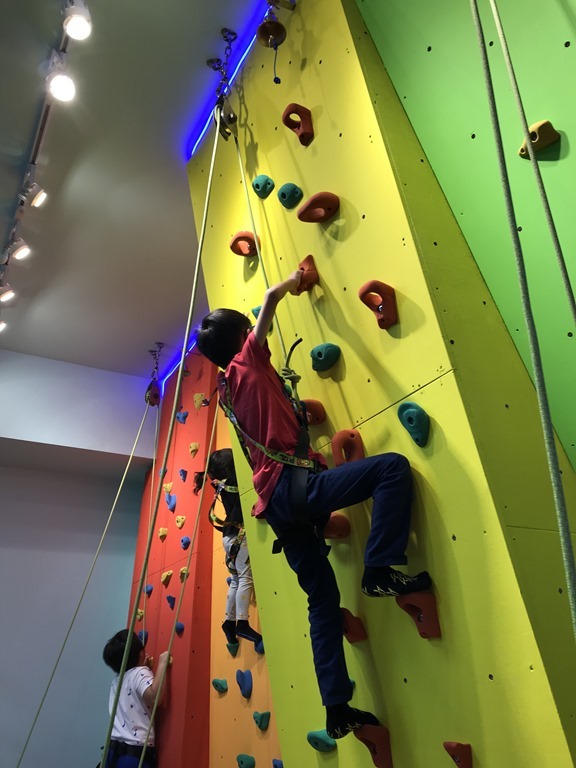 The kids were paired off; thus they learnt teamwork too. Ethen had a bit of problem with an enthusiastic partner who prefer to conduct all experiments by himself. 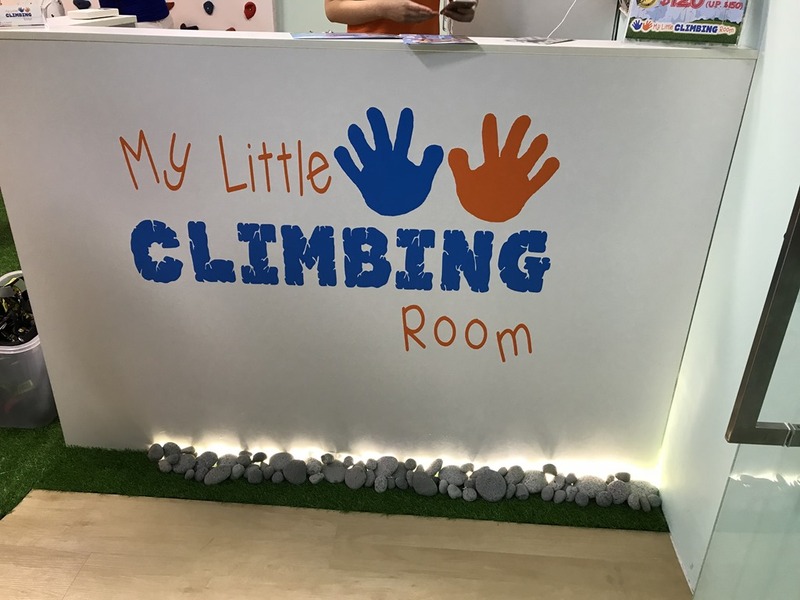 The protective mummy in me wanted to step in…. but I held out and waited to see how he resolved it. He did! without (much) force nor squabbles. 3) Not 1 but 2 experiments! That’s a bonus. With 2 different experiments in 1 session, the kids get to “play” more. The second experiment was more of an investigation on UV rays and the kids made real sunblock! Ethen’s observation was that the chemical reaction created yogurt-like substance (sunblock lotion)! It was a 1hr 15 mins session but felt that the kids wanted to do more! The curious mind of a young kid knows no boundaries. The kids were encouraged to share their answers and observations. Science were made simpler for the young kids to understand and concepts were broken down to bite-size information. 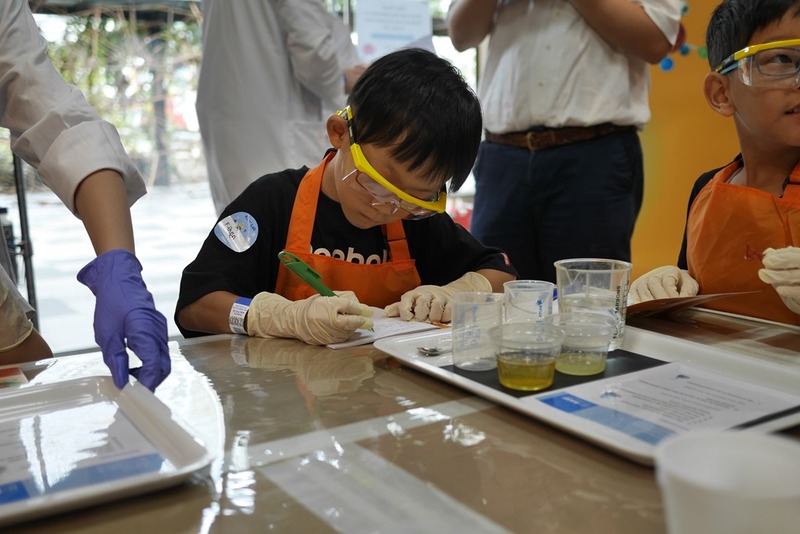 BASF Kids’ Lab is on their way to nurture many new scientists amongst our new generation! It was a good session not to be missed. 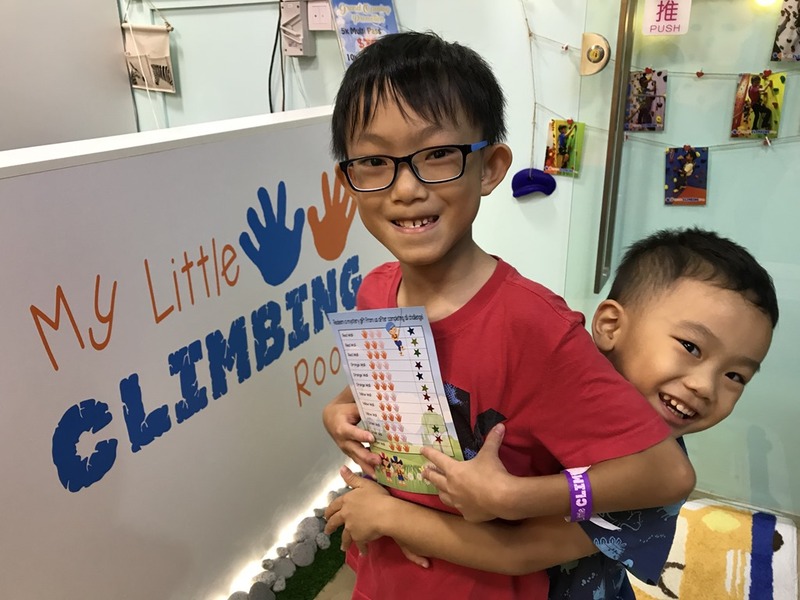 Do hop onto www.nlb.gov.sg/golibrary to book your slot before it all runs out. If you are keen to know what BASF does, check out their Facebook page and their global website. 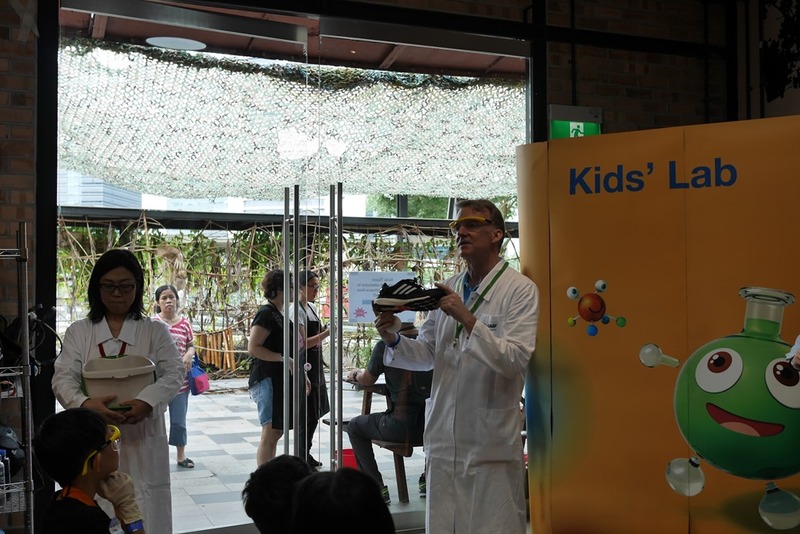 Thank you for BASF Kids’ Lab for giving us an opportunity to experience this and Ethen said he hope science will “become popular”! 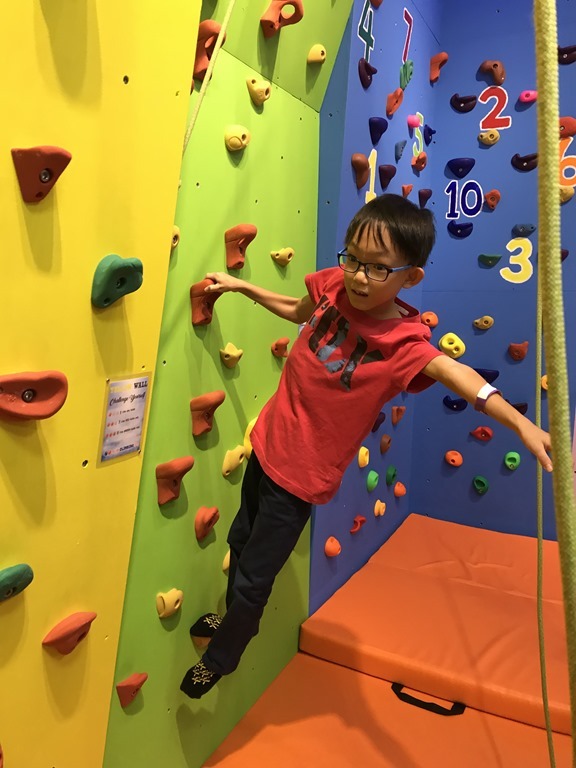 We were in the midst of a hectic schedule of renovating, packing and moving home. 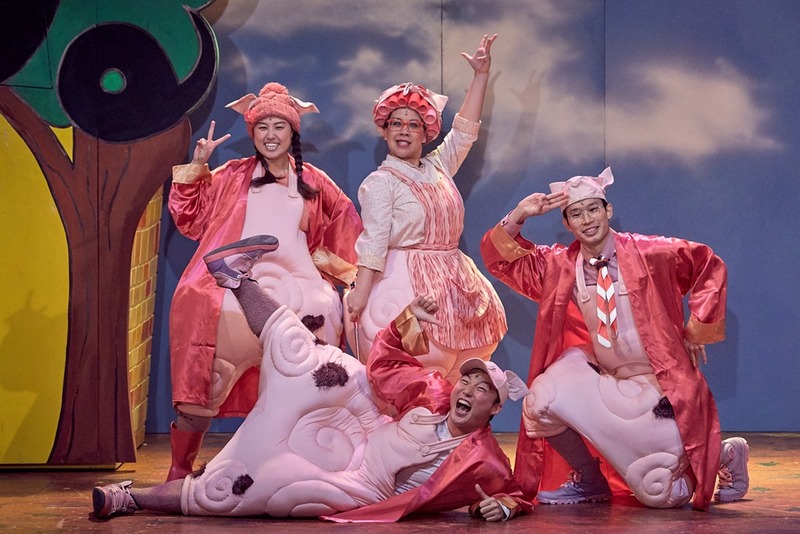 But I knew The Three Little Pigs (By The Little Company / SRT ) were showing this season and I just cannot miss it. Because it is one of the first few bedtime stories that Eizac enjoyed and remembered. I thought it is interesting which are the first fairytale stories parents picked to read to their young toddlers. For me, it is Goldilocks and the Three Bears and The Three Little Pigs! And so, at 3 years old, Eizac had this background understanding that there are 3 little pigs and 1 big bad wolf. And it is a BIG BAD WOLF! We were kindly invited to a weekday morning show. And there were shores of preschool kids in the theatre. Clearly, parents/teachers approve this form of art. And it definitely did not disappoint. 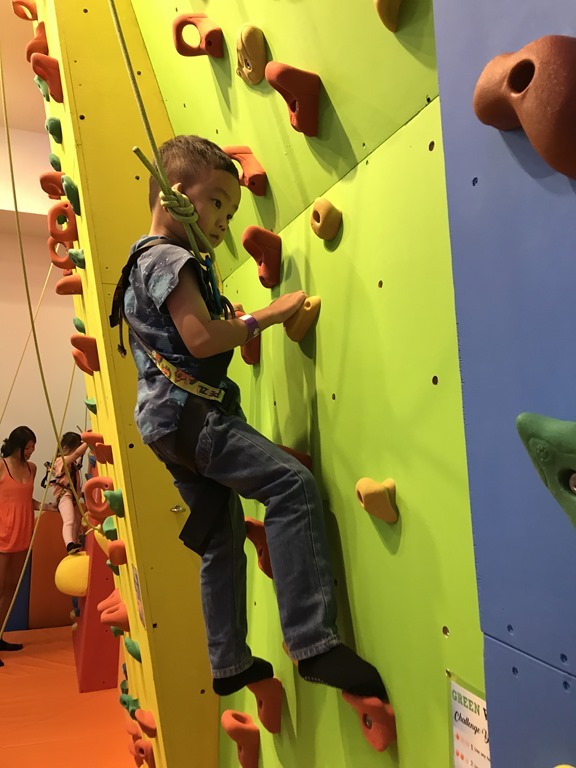 I think the key reason is because both adults and children are entertained. 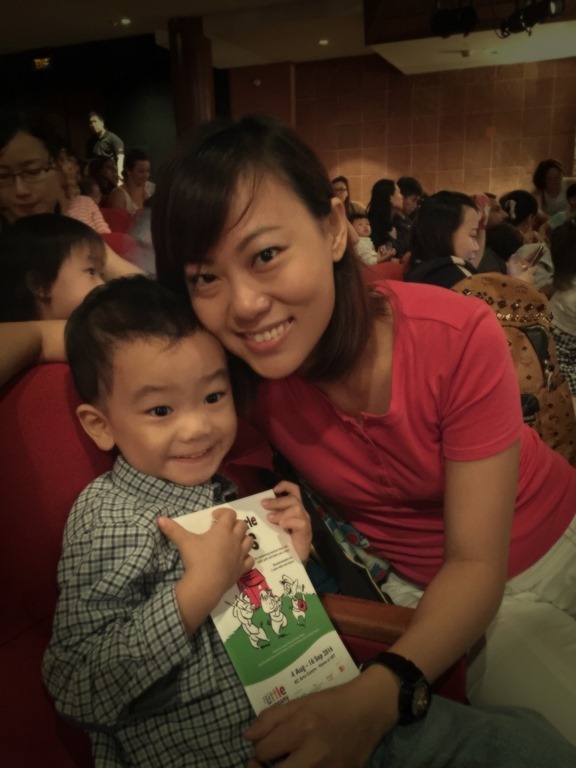 It isn’t just a kids’ production though it is meant to cater to toddlers as young as 3 years old. It has injected enough humour to humour the adults too. 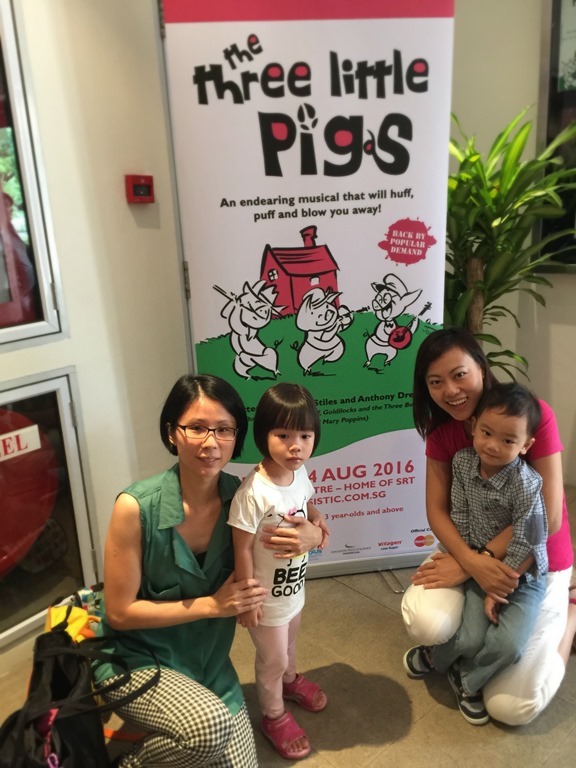 And the end result is always to bring across a positive message; in this case, The Three Little Pigs teaches little ones how success can be achieved through hard work and perseverance. And there are “rewards” for reading your books too. Well, of course and that “evil” (Big Bad Wolf) will never prevail. I always enjoyed SRT’s The Little Company’s productions. 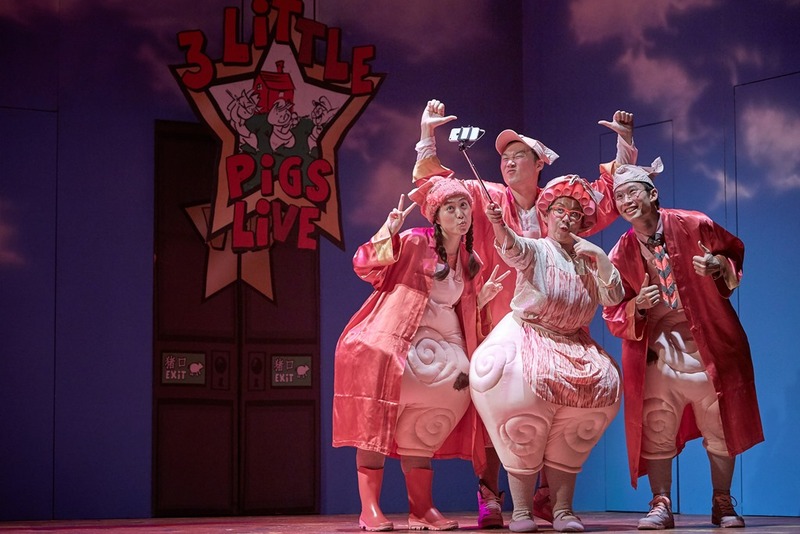 The Three Little Pigs are part of a trilogy musicals for children written by The Laurence Olivier Award winning writing duo, George Stiles and Anthony Drewe. 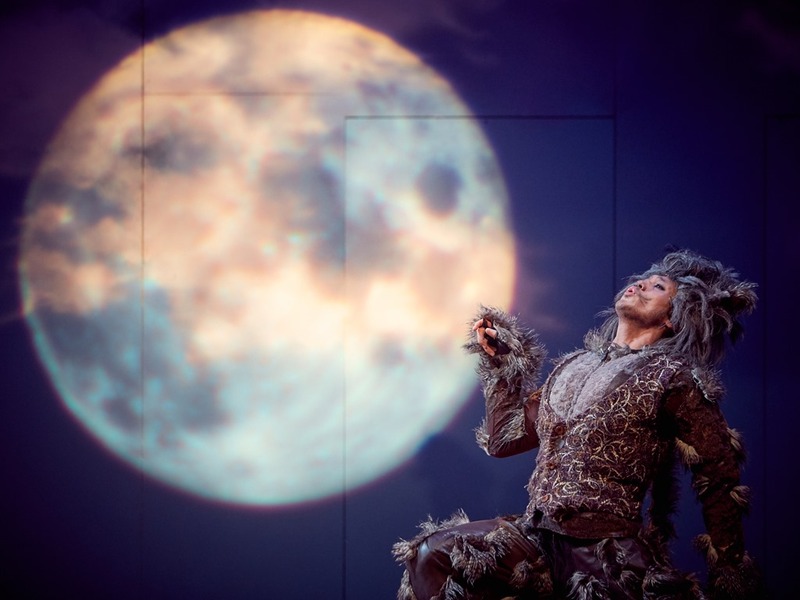 The other two musicals which have also been translated into Mandarin plays are The Three Billy Goats Gruff and Goldilocks and the Three Bears. Read my past review here. Not sure who the duo are? 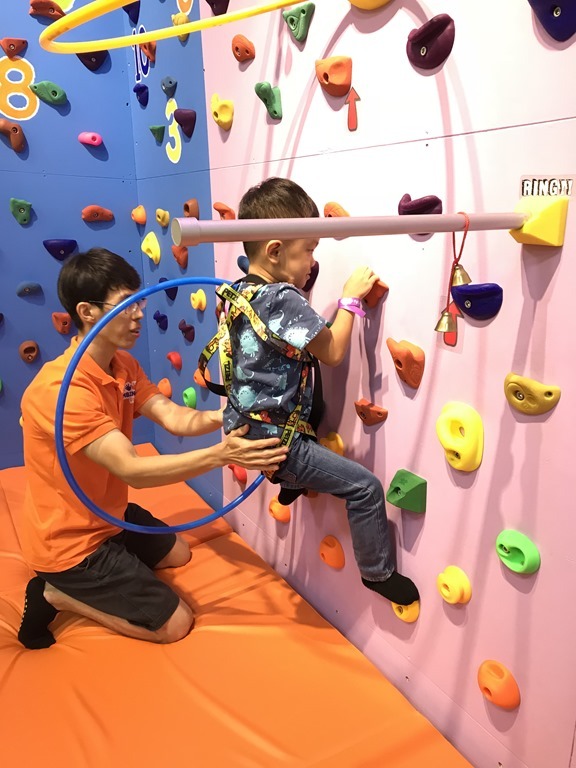 No worries, someone closer to home, well-known ex-mandarin DJ, Danny Yeo, is actively involved in all of The Little Company’s Mandarin children musical productions. Possibly, that’s where all the “local flavours” came about. 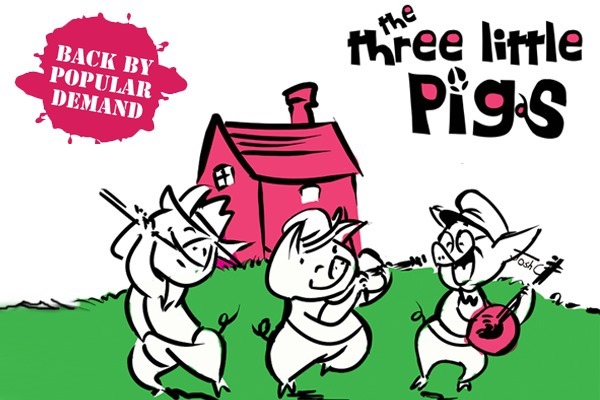 Hopefully, without giving too much away, let me share my version of the synopsis of The Three Little Pigs. << The Three Little Pigs are affectionally known as “Cha”, “Siu” and “Bao”. 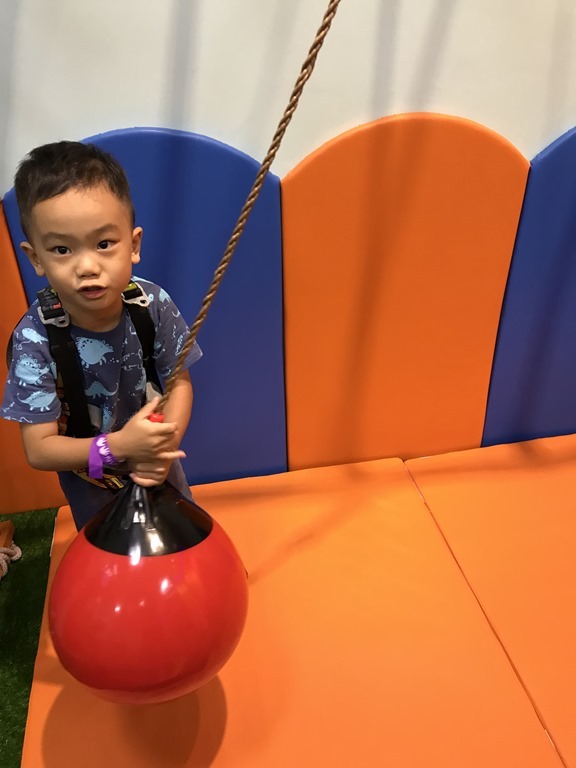 If any of them looked familiar, you might have seen “Bao” in Three Billy Goats Gruff and “Cha” was in some TV commercials such as Ah Ben Nescafe and WaiFai Starhub. Ah Ha! That’s why. 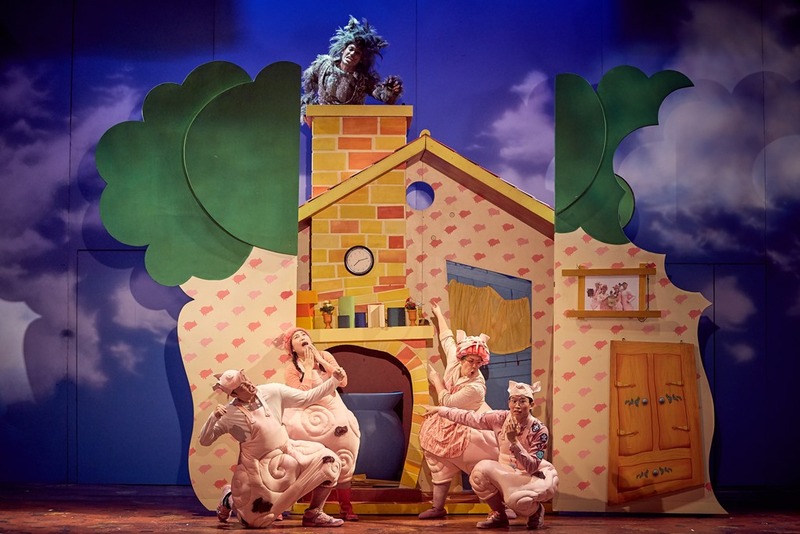 Sadly, Daddy Pig was gobbled up by the Big Bad Wolf and that left their devoted single-parent Mum who decided that her piglets need to move out because her house is a “real PIG STY”! We cannot forget the “baddie” who made the piglets look even more adorable. The BIG BAD WOLF. Here, he does look a little scary when he first took the stage. Later, he was presented as a misunderstood Big Bad Wolf. With his croons and howls, he did made a few new friends in the crowd! I overheard that the he became some of the children’s favourite character in the play. And for the adults, I think we had good laughs at the convenience trade person (watch carefully to see who she is. ). 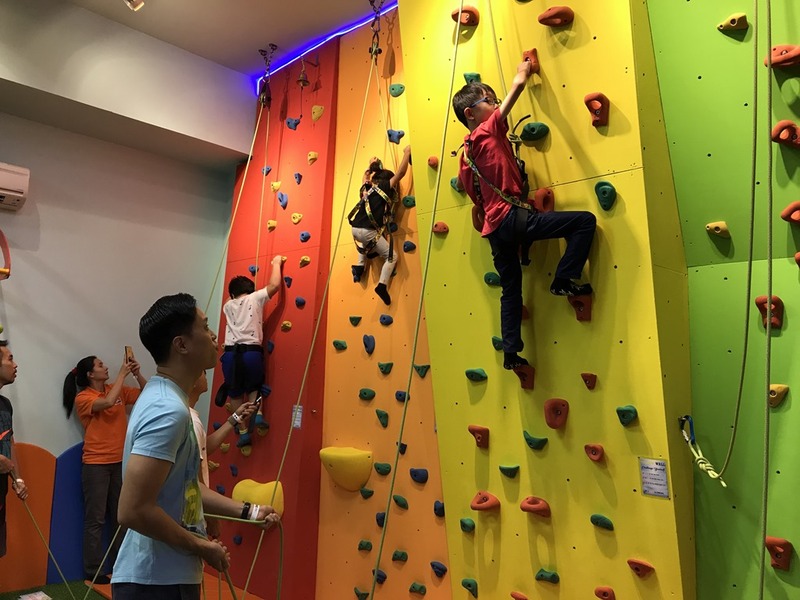 The local humour and some Singlish jokes (not too much) made it highly palatable for the local crowd. The catchy music, colourful stage and interactive actors complete the experience. 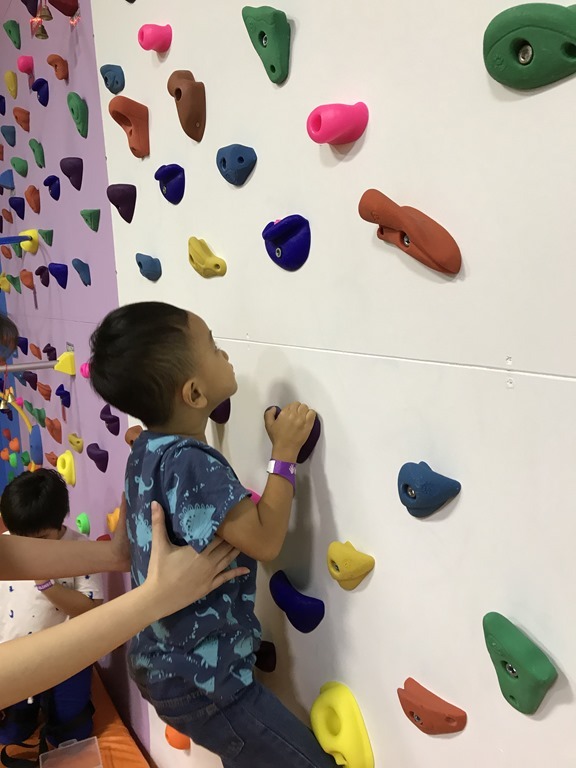 It is a good production which I will highly recommend especially for 3 to 12 years old. Eizac left asking to return for more! With our dates for the morning. 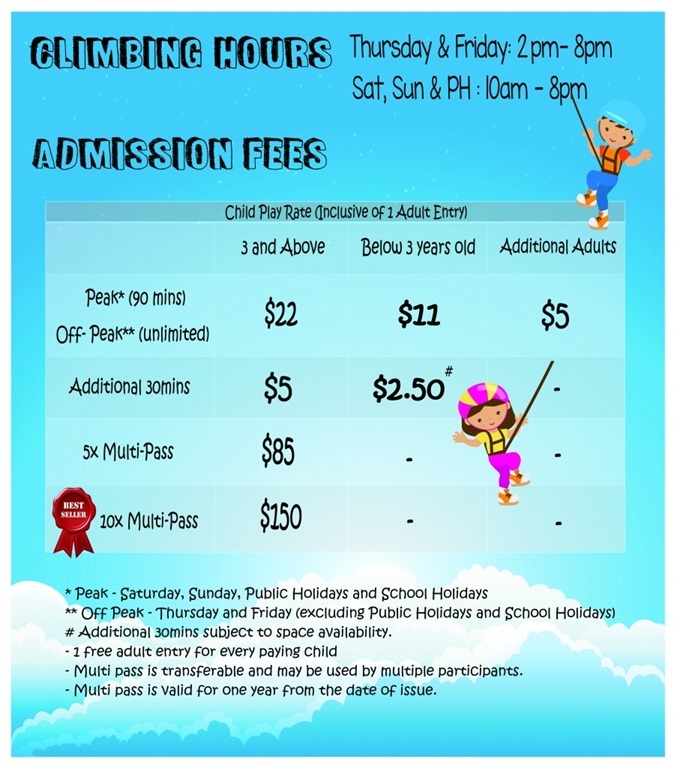 Don’t miss it as this season runs till 16th Sep 2016. Last I checked, the tickets are running out fast! P.S: one small tip to share. The theatre is not a huge one. So any seats will be a good seat unless of course you must be in the first row. Various discounts are available. Do check out SISTIC site for more information and hope you will enjoy the production as much as us! N.B: We were kindly invited for a media review. No further compensation were received. All opinions remained writer’s own. All images except those with the normal folks are copyrights of SRT.